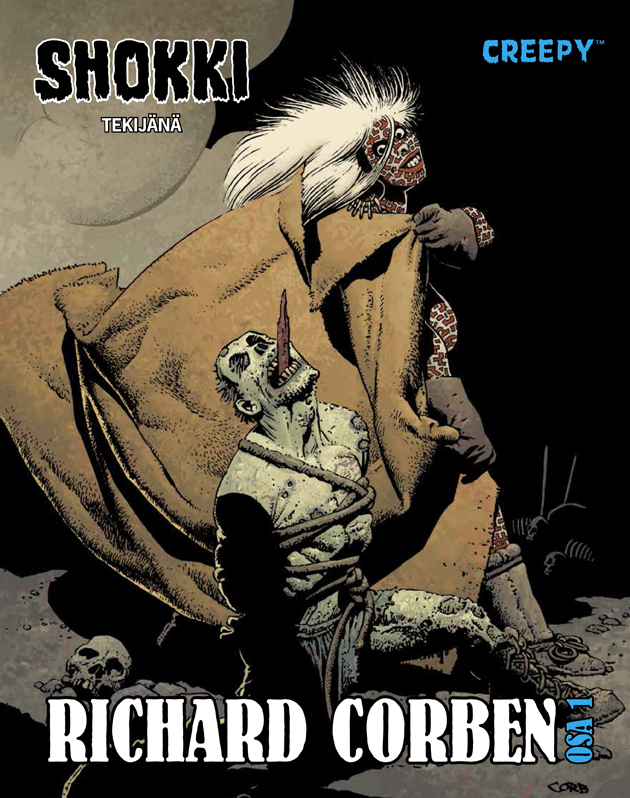 Reprints all Richard Corben comic stories from Creepy & Eerie. Similar print as Creepy Presents Richard Corben (2012), except this version in two parts. Sept. 2013. €27.00. 176[+8] pgs. Egmont has done an Earth shaking cultural achievement! Shokki (transl. Shock) was the major horror magazine way back in golden 70's. It reprinted the best horror comics from Warren's leading magazines Creepy and Eerie. During 1972 to 1976 Shokki appeared in 53 issues. There was also the other Warren magazine in Finnish, Vampirella which appeared only 5 issues during 1974 to 1975. The difference between Shokki and Finnish Vampirella was that the first one was entirely in B&W and the latter one in full color. Sure there was other horror magazines, like Dracula (4 issues between 1974 and 1976), but nothing was as fine as Shokki. Richard Corben is rather unfamiliar artist in Finland. Den saga has never been seen in Finnish. Nor Bloodstar, or any other the most brilliant works by him. The very first sign of the artist was printed in the very first issue of Shokki. On a table of contents was usually printed three plus three excerpt frames from stories of the current issue. The fifth frame was clearly from Richard Corben but you could not find that story from the magazine! Later, in issue #1/73 they finally printed the very first ever printed Warren cover by Richard Corben. It was done for the story called, "Point of View" (by Buddy Saunders/Tom Sutton). You can find both version of covers (the American and Finnish) from this book. I don't know what they did for colors of the cover way back in 70's, but they are in Finnish versio much brighter than in the original one. Just compare them side by in a book. From the same issue (#1/73) you can find also the story from where the table of contents pict was taken. The magnificient story was called, "The Pest! ", or in Finnish "Syöpäläinen!". You can find that story from this book as well under the new title, "Tuholainen". I fell in love with the stunning zipatone work of the story though I realized it was a variation for the old Frank Kafka story called, "The Metamorphosis". Naturally this book's version is similar with the Warren original. In the original Shokki version all Cousin Eerie picts were replaced with Shokki's own Slemmy pictures. Acutally Slemmy was the very same as Uncle Creepy. But I do not complain. The original Shokki quality was poor because of the cheap paper. Some frames were smudgy and fine zipatone surfaces incomplete. The Dark Horse team has done a great job for restoring stories. Some of them has been taken from the original art plates, some scanned from printed magazines. B&W stories are worked by Ryan Jorgensen, but the color ones by José Villarrubia. José used several sources for his restoration and tried to achieve the look Mr. Corben might wanted on high end printing (like this one). Colors are as bright on fine white paper as they could. The very first part of the trilogy Child was originally scanned by José. In the second print of Creepy Presents Richard Corben they replaced pages by scans made by Mr. Corben himself from his own art plates. That better version appeared in Finnish Shokki edition as well! The second Richard Corben story was printed in Shokki #6/75 and was called as "Jäätynyt kauneus" (in this book it was translated as "Jäinen sulous"; originally as "Frozen Beauty"). The third story was in Shokki #9/75 and it was called as "Kirkassilmä!" (in both magazine and book versions), and it's originally "Bright Eyes!". The last Shokki story was printed in #6/76 and it was called as "Kirjatoukka", originally "Bookworm". Everything else in this book (including Child trilogy) you can see for the first time translated in Finnish. The stories are reordered from the order of the original book. This time they did not separate Creepy from Eerie but put them side by side in chronological order. And believe me, though there's a lot of good stories left for the second book, these stories are one of the best during Richard Corben's Warren perioid. Created: September 19, 2013. Modified: December 25, 2018.